Do you like to keep your car looking shiny and clean? Then you are already aware of the value that a good wax brings to your clean car. The issue with waxing is that you don’t always have time for a deep waxing. 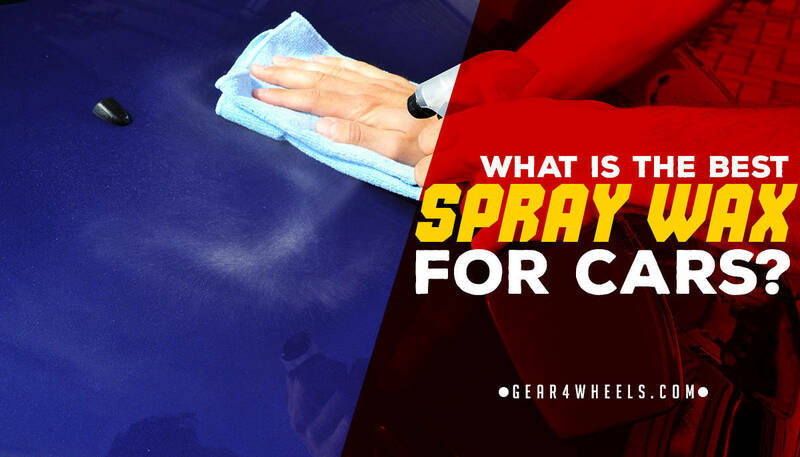 Fortunately, spray waxing makes it really quick and easy to wax your car after a deep wash.
Today, we are going to look at some of the best spray waxes for cars, and how they match up against each other. This wax is really easy to spray on and apply. All you have to do is wash your car, make sure it is dry and then you can apply the spray on wax. Uses a combination of carnauba wax and a polymer sealant to protect your car from grime, waste, dirt and the elements. Definitely one of the ﻿top car waxes﻿ there are, this spray wax by Car Guys is my personal pick as the best spray wax. Lasting:The Car Guys boast that their hybrid spray lasts longer than any other spray on wax in its class. Depending on how often you wash your car and the conditions that you are driving in this wax can maintain its integrity for several weeks before you need to reapply it. Ease of use: This wax is really easy to spray on and apply. First, make sure that your car is totally clean, and it is best if your car is dry. Then, you simply spray on the Car Guy’s wax and wipe it in with a microfiber cloth. Spray type: This particular spray on wax uses a combination of Brazilian carnauba paste wax along with the help of a liquid car polish. This gives your car added protection and a longer lasting shine with every use. It gives your car the look of that deep, glassy wax shine that you see in the commercials. Method of application: The trigger spray bottle for this wax makes it really easy to spray on and wipe down. All you have to do is spray the wax generously onto the surface of your clean car, and wipe it down with a microfiber cloth. Protections: This wax is perfect for protecting your car from dirt, smudging, weather, sunshine and the elements in general. It even creates a hydrophobic coating over your car to wick away water and prevent water spots from gathering on the surface of your car. Lasting:Depending on how you apply your wax and how much wax you apply to the exterior of your car, protection can last for anywhere from four to six weeks. Ease of use: One of the best aspects of this wax is how easy it is to use it. All you have to do is simply spray or mist on the wax, and wipe it off. It is as easy as that, and you can even use this wax spray when you are in direct sunlight. Spray type: This is a special blend of premium carnauba wax that will give a deeper appearance to the finish of your car. This wax was engineered to make your car shine to the full potential of the paint job. Method of application: Applying this wax spray is as simple as misting it onto the exterior of your car. The recommended way of wiping down the wax is using a premium microfiber cloth to apply the wax over the outside paint job of your car.This wax should only be used with gloss paint jobs and clear coats. This product is not meant for use with matte, satin, or flat finishes. Protections: This simple wax preserves your car by protecting it from any aging that is associated with normal wear and tear. This wax also protects your paint from outside contaminants. We really appreciate that this wax is so easy to use and apply. You simply spray it on, wipe it in with a microfiber cloth, and your car is ready to go. Lasting: A good coat of T-9 can last for several weeks depending on the conditions that you are driving in. Ease of use: This is yet another wax that is really easy to apply and use on your car. All you have to do is wash your car first. Then you can simply spray on the Turtle wax and wipe it off with a towel or microfiber cloth. Spray type: This particular spray uses a combination of carnauba wax and protective polymers. The wax gives your car the shine on your paint job that you long for, and the polymers protect your car from harmful debris and contaminants. Method of application: This is another trigger spray bottle car wax. Before you wax your car, make sure that the exterior is washed completely clean and dried. Then you can easily spray on your car wax from the spray bottle, and wipe it down with a microfiber cloth. Protections:Besides protecting your car from dust, dirt, and and the typical elements that you face while on the road, you get added UV protection for your car. The sun can be wearing on the paint of your vehicle, which is why T-9 Turtle Wax has built-in UV protection. Lasting: This wax product will last for a few weeks. The added benefit of this wax is that you can use it as an ongoing applicant for any time you get smudges or some small blemishes in your finish. Ease of use: This wax also uses your basic trigger spray bottle to make it as easy to use as possible. You simply use the trigger spray bottle to spray on the wax, and scrub the wax in with a clean cloth or a microfiber cloth. This wax is great for using on a wet or a dry surface. You can use it as a standalone wax or you can apply it to your existing wax surface to enhance the effect. Spray type: The ingredients in this particular product can either purpose this wax for use on its own, or you can use it for enhancing or detailing the current coat of wax on your car. This product is best for using on gloss or clear coat paints. Method of application: Make sure that your car is washed and clean before applying Mother’s car wax. For this wax, you simply use a spray bottle application. Follow that up wiping in your wax with a microfiber cloth for the best application. You can keep applying this wax to maintain the sheen of your car, so that you can keep small smudges and blemishes off of your paint. Protections: This particular wax is the best for frequent or ongoing regular use on your car. We have all had that experience where we clean, wax, and polish our car, only to find that over the next few days we get smudges, fingerprints, and dirt on the coat. What’s great about Mother’s is that it allows you to touch up your wax, and eliminate those blemishes, even after you’ve just waxed your car. This is super easy to apply and use. If you are using it as a standalone wax, just make sure that your car is totally clean before applying it. Lasting: If you wash your car regularly, this wax will easily last you between washes. You can apply it every 2-6 weeks, depending on how often you wash your car. Ease of use: This spray on wax is really easy to use and apply to your vehicle. All you have to do is use the spray on bottle to apply the wax to your clean car. Then use a microfiber cloth to rub in your wax to make your paint shine like it is new. Spray type: This wax uses a classic trigger spray bottle, which makes it effortless to use and apply to your car. This particular product uses a carnauba wax base and a chemical combination that protects your paint and keeps it looking shiny and fresh. Method of application: This is another multi-purposed wax that you can use in one of two ways. You can use this wax to enhance your existing coat of wax, or you can apply it to your clean car as a standalone car wax. From there, all you have to do is use a clean microfiber cloth to rub the wax into your car. Protections: This wax is best used to protect your car from the sun, dirt, contaminants and any other elements that you expose it to when driving. Lasting: Optimum spray on wax can last for up to five months. Ease of use: This car wax by Optimum is really easy to use and apply. You can simply use the trigger spray bottle to mist the wax solution onto your car. Then, just use a clean microfiber cloth to wipe it down. Spray type: What is really nice about this particular wax is that it doesn’t contain any harmful or hazardous chemicals, VOC’s or solvents. It is perfectly safe to use. This product uses a combination of carnauba wax and a polymer sealant to give your car a nice, clean glossy finish. Method of application: All you need to apply this wax to your car is the spray bottle and a clean microfiber cloth. Simply rub or glide the wax in circulation motion onto your car and you are good to go. You can also use this wax on chrome, glass surfaces and plastic trim. Protections: This product protects your car from UV rays, road grime, acid rain, bird waste, contaminants and pollutants. Another nice feature of this wax is that it can last for up to five months. Lasting: This wax provides for a resilient, hydrophobic coat that can last for weeks on your car. Ease of use: This spray on wax by Meguiar’s is really easy to use and apply. All you have to do is spray it onto the paint coat of your car, and wipe it down with a microfiber cloth for a quick and easy shine. It only takes minutes to apply and use. Spray type: This wax also uses a hydrophobic polymer technology to prevent water from beading on your car. It also adds extra protection from inclement weather, grime and waste that you may face on the road. Method of application: This simple and strong wax comes in a trigger spray bottle that makes it really easy to spray on and wipe it off. It will not leave any white residue on any of the plastic or trim pieces of your car. Protections: This spray on wax provides weeks of protection from rain, waste, grime, dirt, beading water and water spots on your car. Now that we have taken a look at some of the best spaw waxes for your car, what are some of the best ways to choose the right wax for you? The first thing that you want to do is make sure that you find a wax that fits the finish of your paint job and your finish. You will notice that some waxes work with certain finishes like gloss and clear coat. Then, choose the best wax based on your climate. Climate and weather are really important indicators as to what kind of wax you should get, and can vary greatly in different parts of the country. For this review, we focused on using spray on waxes to wax your car. With most of these waxes, it is best to use a clean microfiber cloth to wipe down/off your wax after you apply it. If you can, avoid waxing your car in direct sunlight. The sun and heat can cause your wax to smear across your car. Also, it is always best to wax your car immediately after it has been washed and dried. That will be the best for maximum protection of your car. The biggest benefit that you get with using spray wax as opposed to traditional waxing is that you save a lot of time. Spray waxing is quick, effective and can give your car weeks of glassy shine and protection. The biggest drawback is that your wax job is not going to be as thorough when you are just spraying it out and wiping it off by hand. When is the best time to apply spray wax? After you have completely cleaned your car. Wax looks and worst best when you apply it to a clean surface. How much wax can I spray on? The nice thing about spray wax is that you can apply a little or a lot depending on your preference. Don’t spray too little or you won’t get that lasting shine, and if you spray too much you may cause your wax to smear. Which of these waxes did you find to be the most appealing? For us, that wax is the Car Guys Auto Hybrid Spray Wax. It has everything that you need in a quality car wax. It is easy to use and apply, long-lasting, is non-toxic and totally environmentally friendly.